Just as it was difficult to decide on what song ought to illustrate ‘The Sarah Years’, so I also thought long and hard about what track ought to act as soundtrack to ‘The Drum’n’Bass Years’. After all, there really are so many shockingly good records to choose from. It could have been Goldie’s astonishing ‘Terminator’ from 1992, but really when it came down to it I could not choose anything but ‘That Summer Feeling’ to document that particular year. Or perhaps LTJ Bukem’s remarkable ‘Music’ from 1993 which I admit only just lost out to ‘French Disko’ in a bloody late night shoot out. ‘Terminator’ though really was the spark that eventually led to my immersion in the concatenation of fractious beats and heart-stopping sub bass detonations. For several years it felt as though not much else mattered and I admit that I devoured the latest 12”s in the same way I once hoovered up Indiepop 7”s. It took years for my bank balance to recover, yet the thrill was certainly worth the cost. Of course by 1995 the sounds of d’n’b were already in many places becoming smoothed and smothered and never more so than on Goldie’s often dreary crossover ‘Timeless' album (though ‘Inner City Life’ still sounds like a splendid Pop single). D’n’b was infiltrating and infecting ‘the mainstream’ and artists were cropping up in all sorts of places remixing all kinds of unexpected records. It probably says a lot about the times when I tell you that I cannot think of one off the top of my head that really left a mark. Yet I expect it helped pay the rent and allowed the likes of Rupert Parkes to continue to hone their art. It is Parkes then that gets the nod to illuminate 1995 with his ‘UFO’ cut, a track that takes Parkes’ trademark atmospheric constructions and drops in the audio from Lt. Col. Charles Halt’s investigation of an unexplained incident in Rendelsham Forest, Suffolk in December 1980. The narrative of Halt’s speech is treated as another instrument to be played with. Chopped, repeated and re-configured it is at times a rhythmic device mimicking the syncopated and spliced beats; at others it plays out more fully, building the story, weaving through the dense clouds of bass just as you imagine the narrator and his squad treading carefully through the Rendlesham forest at night. Is this melding of sound and dialogue a precursor to Parkes’ successful soundtrack work in Hollywood? Perhaps, perhaps not. Certainly the six minutes of Parke’s record passes almost in a blur of extraterrestrial disorientation that plays out cinematically on our aural retinas. Intriguingly, Parkes’ track predates the official release of the Rendlesham Forest recordings by a good fifteen years. So was ‘UFO’ itself a strange time-slip phenomenon, leaping across the decades in a worm-hole blip of the eye? For sure it would explain why, like all great records it sounds curiously both utterly of its time and remarkably timeless all at once. Time is fluid, history fiction. If you were to ask me to choose one visual artist whose work somehow fits with the chopped up rhythms of drum’n’bass then I suspect I might choose Cy Twombly over any number of perhaps more obvious ‘urban’ graffiti artists. His apparently arbitrary yet remarkably ordered scribbles, scratches and scrawls seem to me to perfectly echo the twists, turns and tumbles of the sparsest, finest d’n’b productions. In both too to space is vital. But I hardly need to say that by now, do I? Not that there is no connection to be made, for Twombly was famously as much an inspiration to the work of Jean Michel Basquiat as Warhol, and you surely do not get any more fashionably urban than Basquiat in the world of painting. 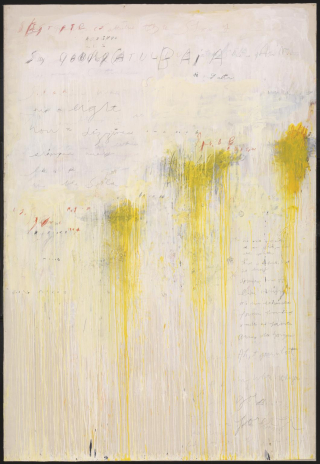 Twombly’s 'Quattro Stagioni’ was completed in 1995 and is, perhaps, the visual lightness to the aural darkness of Photek. Do all four parts of the monumental painting still hang in Tate Modern? I have not been there for many years, but I hope they are still on display. Like the room of Rothkos (which incidentally were never displayed so beautifully as when they were in the Tate at Milbank) they deserve to be on permanent view. Of the four paintings, each conjuring a season, ‘Estate’ (Summer’) is, obviously, our choice for this series; like the season it portrays 'Estate’ is seductive and gentle, explosive and tender. As in Motherwell’s ‘Elegy To The Spanish Republic’ the painting is invested with the white light of a hot summer, through which echoes of text vibrate and lazily wink. Yellows erupt like fireworks in the sky and bleed down the canvas like honey. Metaphysical meaning evaporates in the sun and teases us with languid suggestions of faded memory. Time is fluid, history fiction.